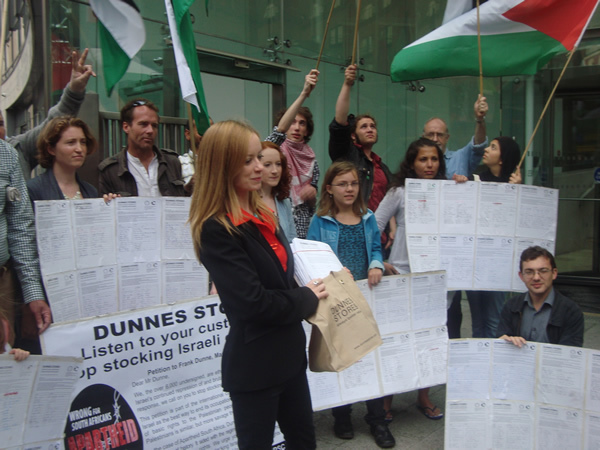 Today, Thursday 29th July 2010, at 1pm, the Ireland Palestine Solidarity Campaign (IPSC) delivered a petition to Dunnes Stores signed by over 6,000 shoppers across Ireland. 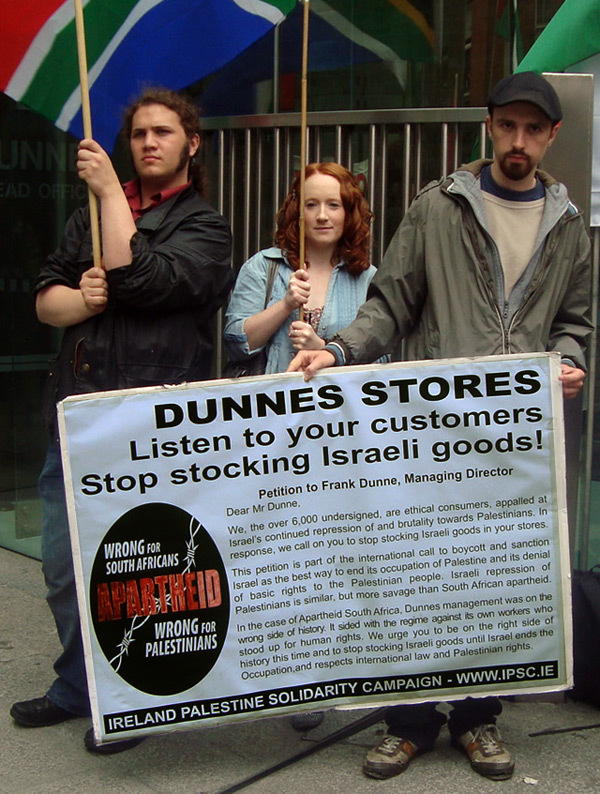 The petition demands that Dunnes Stores stop stocking Israeli products, until Israel respects Palestinian rights and international law. Present at the handing-in were Brendan Archbold, the trade union official at the centre of the 1980s Dunnes strike when workers refused to handle South African goods, Freda Hughes IPSC National Chairperson, Aengus O'Snodaigh TD of Sinn Fein along with supporters of the campaign and members of both the Palestinian and South African communities in Ireland. 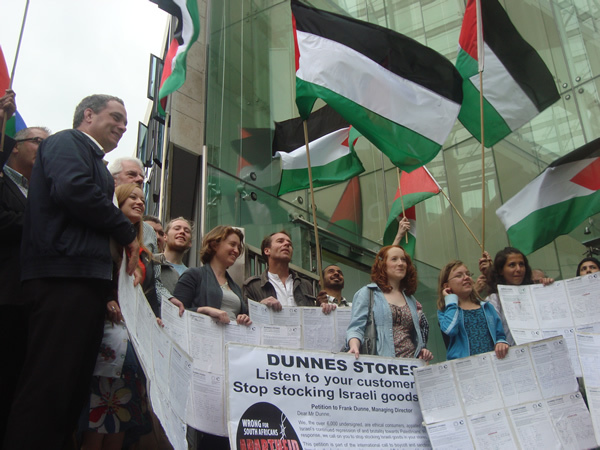 The petition has been signed by over 6,000 shoppers in a two-week blitz that has seen Palestine solidarity activists enlist the support of Dunnes’ customers across the country. Signatures have flooded in from Dublin, Belfast, Cork, Derry, Limerick, Galway, Kilkenny, Newry, Wexford, Waterford, Bantry, Gorey, Enniscorthy, and Sligo. In many locations around the country, solidarity activists presented their local Dunnes' managers with copies of the petitions they have collected. This campaign comes a quarter-century after Dunnes was at the centre of a bitter two-year campaign of boycott and pickets, when it sacked a group of workers who refused to handle South African goods. "Dunnes was on the wrong side of history, siding with the South African apartheid regime against its own workers," Freda Hughes, IPSC Chairperson, said. "This is a chance for it to put itself on the right side of history. 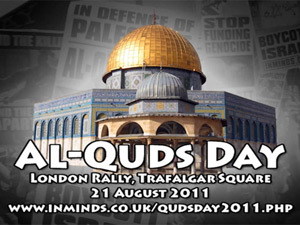 Israel's treatment of Palestinians amounts to nothing short of Apartheid. We must not ignore the lessons of South Africa and how apartheid was ended there – essentially it jumped before it was pushed. The boycott campaign can, and should, be used to isolate Israel both figuratively and literally until such a time as it complies fully with international law and ends its Apartheid regime in Palestine. We are not asking consumers to boycott Dunnes Stores. 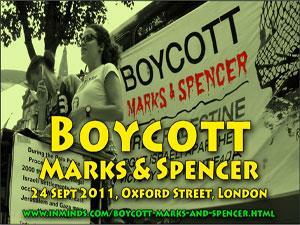 We are asking Dunnes Stores, and consumers islandwide, to boycott Israeli goods and services. This campaign is not designed to negatively affect Irish jobs." Ms. Hughes continued," We are delighted to see representatives from both the Palestinian and South African communities here today to show their solidarity and call for progressive steps to be taken in ending Israeli Aparthied and its abuse of human rights in the region. 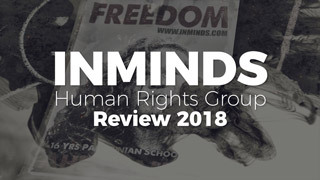 We are asking Dunnes to show its support for human rights and justice by refusing to stock Israeli goods just as the US chain-store Olympia Food Co-op in Washington State did last week." 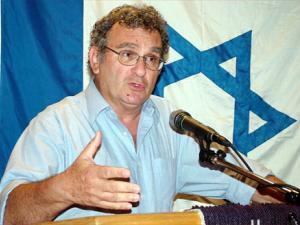 Brendan Archbold said, "The parallels between the old Apartheid regime of South Africa and the state of Israel are quite striking. 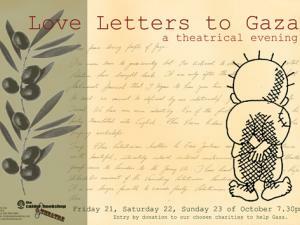 Just as South African forces shot and killed their own people in Sharpeville and Uitenhage, so too do the Israeli military adopt a shoot-to-kill policy whether it is in relation to the Palestinian people themselves or those peaceful supporters of the Palestinians aboard the international flotilla recently attacked by Israel." 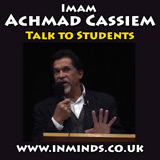 Mr Archbold concluded with a call for a boycott of Israel, "Just as Israel models itself on the old racist regime in South Africa, so too must we must model our response on the boycott policy that contributed so much to the ending of Apartheid. The Irish Congress of Trade Unions has adopted a comprehensive policy in relation to the isolation of Israel and it is now up to all trade unions and all trade unionists to ensure that this policy is implemented in full." 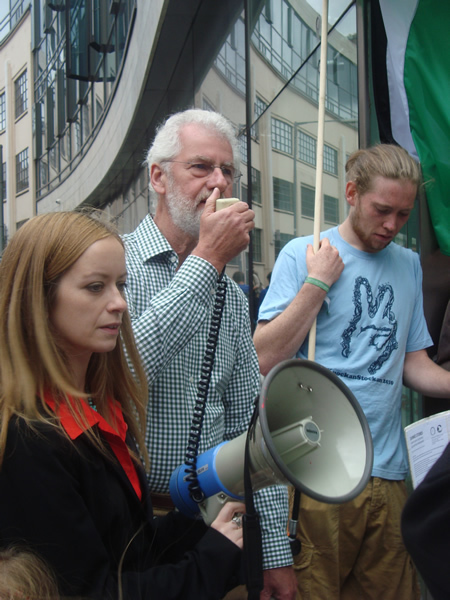 Aengus O'Snodaigh spoke of his support for this campaign and said,"Israel has a long history of human rights abuses against the people of Palestine, and it believes it is beyond reproach for its apartheid policies. Israel needs to understand there are political and economic consequences for its crimes, and a consumer and retailer boycott of Israeli goods is an important aspect of holding Israel to account. 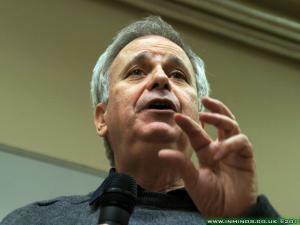 I support this petition, but also call on the Irish and other European governments to suspend Israel's preferential trading status with the EU under the Euro-Med Agreement." 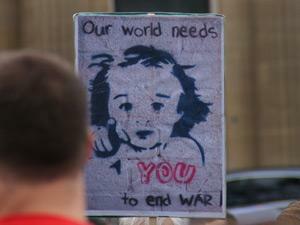 The petition campaign is part of a coordinated international effort for Boycott, Divestment and Sanctions (BDS) against Israel, which has seen actions take place in dozens of countries, including Israel and South Africa. 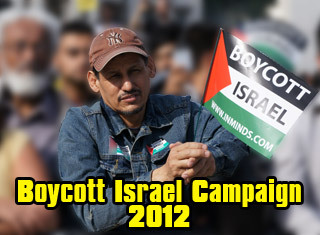 Many South African organisations, and figures including Archbishop Desmond Tutu, have endorsed the BDS campaign. When Vonnie Munroe walked off her job in protest at the Dunnes Stores selling South African goods 20 years ago today, she did not realise that it would cost her her home..